Bag, The Cambridge Satchel Company. LOVE. F-I-N-A-L-L-Y, it arrived! My sweet parents ordered this bag as a birthday gift for me 1 month in advance to make sure it arrived on time. Unfortunately Cambridge Satchel Company, who by the way has the worst customer service, screwed up and it arrived yesterday. However, some things are worth waiting for, and this bag is definitely one of those things. Love the sturdy leather, the color (obviously) and the fact that my parents had it monogrammed! This baby is going to give my Céline bag some serious competition from now on! I’m literally in love with that bag! The color is AMAZING! LOVE the monogram, fabulous detail. I’ve had my eye on one of these babies for a while! What a great gift doll, love that it’s monogrammed! that pea green is beautiful, though I really don’t think I could pull it off!! It’s beautifully made, I love the detail! 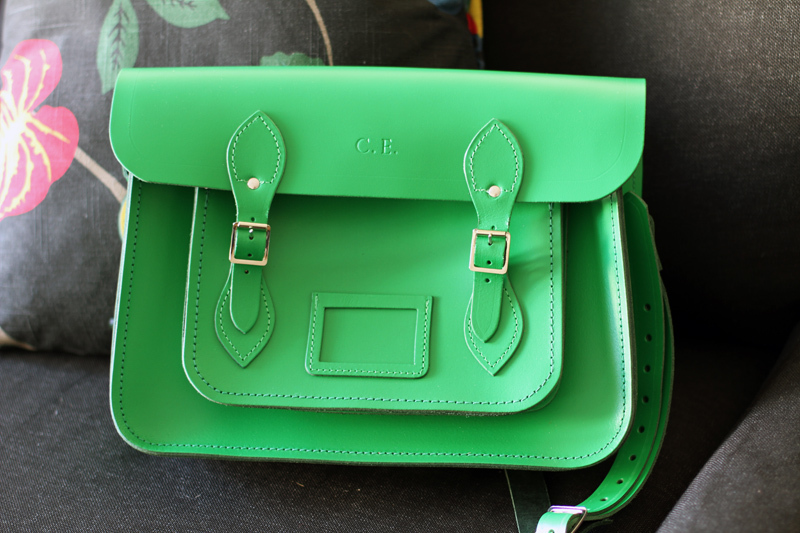 ooh i’ve had my eye on the cambridge satchels for a while! i love that they are so affordable. So gorgeous, love the color! and also very cool that it’s monogrammed! too bad it was late, but it’s sooo beautiful!! so nice to have a personal touch like that as well! wow this bag is truly amazing ! the colour is gorgeous ! i’m in love with this bag for so long. I’m thinking to buy it too, did you buy the 14″ one?? Very pretty!!! Love the green and the fact that it’s monogramed! I really love this one!! iÂ´ve bought the candy bag in green too and i love this colour for summer!!! Gorgeous, love the shape and that color is incredible. Wow, a dream of a bag! Wow, it’s a dream of bag!! Wow! I think I saw this on ASOS and liked it! Looks fab! it’a amazing !!! and it has your initials<!!!! Amazing!! oh the colour, simply amazing!! Oooh hello there indeed! This bag is absolutely stunning, need one of these desperately! Kärlek till dig och till väskan! ohh, this is on my birthday wishlist too! love the bag it is gorgeous! love the color as well the green is amazing! wow I love how solid this bag is! what a fab freakin’ BAG! What a lovely satchel! Shame about the service of the company though. You’re parents are amazing. That Cambridge satchel is total eye candy! love the color…its sure to wait for!!! the color is absolutely incredible! love this bag. you are lucky girl! awww your parents are so sweet! LOVE IT! It’s so pretty, especially the color! holy freaking jeez that bag is gorgeous. so jealous! Really beautiful bag, I love how linear it is. Also, love love loving the color. I have one of these in red, I love it too! I didn’t have any issues but I ordered mine through Urban Outfitters. I looooooooooooove this bag! Have been wanting to order it for some time now. Am drooling over it! Love it! This color is beautiful! wow, this bag is definitely an adversary. :) its wonderful. My friend has that bag in the same color..its amazing!! Wow, i love this!!! The colour is amazing! I have this exact bag (with my own initials, of course). LOVE IT. Be prepared to have strangers ask you about it every time you take it out. And yes, it took about a month to arrive, but it was worth the wait. The perfect colour pop accessory! So cute. Great buy! Shape, colour, size, everything perfect! I love the bag but may I ask how many “inch is this one?? You would help me out a lot because as you mention their customer service is rubbish and there aren’t any clear pictures on their website. You would help me out a lot, thanks in advance and have a great weekend! I’m about to order one for myself, so thanks for the heads up on their customer service. I really love it in green, can’t wait to see it in your looks! That bag is just perfect. So beautiful, the color is so special! Can’t wait to see it in your outfit posts! That’s one really nice bag! I think the colour matches perfectly with you, and your style. It is beautiful! I know it was a gift, but I’m so curious about how much it was- would love to get me one of these! The color green is such a unique color. It will make any outfit pop. OH I’m so gonna ask my boyfriend to bring me one since it’s not easy to do online shopping in Indonesia..
Love the bag and definitely the color! The bag is absolutely stunning, thought the colour is really bright!! The bag is just perfect. I’ve got one as well. Mine is red with an E and a dot on it: “E.” My boyfriend gave it to me one year ago when I turned 20. I love it to death and wear it to school every day. how did you get your styling job??? your bag is super amazing! love the color and the design! Love your new bag, such a nice shape, and the colour is really refreshing! I went directly to the website to check out their collection of bags. And I was wondering, wich size is you bag?